15 to 30 metres (50 to 100 ft) with maximum runup of 51 m (167.3 ft) at Lhoknga. The earthquake was initially documented as moment magnitude 8.8. In February 2005 scientists revised the estimate of the magnitude to 9.0. Although the Pacific Tsunami Warning Center has accepted these new numbers, the United States Geological Survey has so far not changed its estimate of 9.1. The most recent studies in 2006 have obtained a magnitude of Mw 9.1–9.3. Dr. Hiroo Kanamori of the California Institute of Technology believes that Mw 9.2 is a good representative value for the size of this great earthquake. The hypocentre of the main earthquake was approximately 160 km (100 mi) off the western coast of northern Sumatra, in the Indian Ocean just north of Simeulue island at a depth of 30 km (19 mi) below mean sea level (initially reported as 10 km (6.2 mi)). The northern section of the Sunda megathrust ruptured over a length of 1,300 km (810 mi). The earthquake (followed by the tsunami) was felt simultaneously in Bangladesh, India, Malaysia, Myanmar, Thailand, Singapore and the Maldives. Splay faults, or secondary "pop up faults", caused long, narrow parts of the sea floor to pop up in seconds. This quickly elevated the height and increased the speed of waves, causing the complete destruction of the nearby Indonesian town of Lhoknga. The epicenter of the 2004 Indian Ocean earthquake and associated aftershocks in French. The epicentre of the earthquake, just north of Simeulue Island. Great earthquakes such as the Sumatra-Andaman event, which are invariably associated with megathrust events in subduction zones, have seismic moments that can account for a significant fraction of the global earthquake moment across century-scale time periods. Of all the seismic moment released by earthquakes in the 100 years from 1906 through 2005, roughly one-eighth was due to the Sumatra-Andaman event. This quake, together with the Good Friday earthquake (Alaska, 1964) and the Great Chilean earthquake (1960), account for almost half of the total moment. The much smaller but still catastrophic 1906 San Francisco earthquake is included in the diagram for perspective. Mw denotes the magnitude of an earthquake on the moment magnitude scale. Since 1900 the only earthquakes recorded with a greater magnitude were the 1960 Great Chilean earthquake (magnitude 9.5) and the 1964 Good Friday earthquake in Prince William Sound (9.2). The only other recorded earthquakes of magnitude 9.0 or greater were off Kamchatka, Russia, on 4 November 1952 (magnitude 9.0) and Tōhoku, Japan (magnitude 9.0) in March 2011. Each of these megathrust earthquakes also spawned tsunamis in the Pacific Ocean. However, the death toll from these was significantly lower, primarily because of the lower population density along the coasts near affected areas and the much greater distances to more populated coasts and also due to the superior infrastructure and warning systems in MEDCs (More Economically Developed Countries) such as Japan. The 2002 Sumatra earthquake is believed to have been a foreshock, predating the main event by over two years. Seismographic and acoustic data indicate that the first phase involved a rupture about 400 kilometres (250 mi) long and 100 kilometres (60 mi) wide, located 30 kilometres (19 mi) beneath the sea bed—the largest rupture ever known to have been caused by an earthquake. The rupture proceeded at a speed of about 2.8 kilometres per second (1.7 miles per second) (10,000 km/h or 6,200 mph), beginning off the coast of Aceh and proceeding north-westerly over a period of about 100 seconds. A pause of about another 100 seconds took place before the rupture continued northwards towards the Andaman and Nicobar Islands. However, the northern rupture occurred more slowly than in the south, at about 2.1 km/s (1.3 mi/s) (7,500 km/h or 4,700 mph), continuing north for another five minutes to a plate boundary where the fault type changes from subduction to strike-slip (the two plates slide past one another in opposite directions). The Indian Plate is part of the great Indo-Australian Plate, which underlies the Indian Ocean and Bay of Bengal, and is drifting north-east at an average of 6 centimetres per year (2.4 inches per year). The India Plate meets the Burma Plate (which is considered a portion of the great Eurasian Plate) at the Sunda Trench. At this point the India Plate subducts beneath the Burma Plate, which carries the Nicobar Islands, the Andaman Islands, and northern Sumatra. The India Plate sinks deeper and deeper beneath the Burma Plate until the increasing temperature and pressure drive volatiles out of the subducting plate. These volatiles rise into the overlying plate causing partial melting and the formation of magma. The rising magma intrudes into the crust above and exits the Earth's crust through volcanoes in the form of a volcanic arc. The volcanic activity that results as the Indo-Australian Plate subducts the Eurasian Plate has created the Sunda Arc. As well as the sideways movement between the plates, the sea floor is estimated to have risen by several metres, displacing an estimated 30 cubic kilometres (7.2 cu mi) of water and triggering devastating tsunami waves. The waves did not originate from a point source, as was inaccurately depicted in some illustrations of their paths of travel, but rather radiated outwards along the entire 1,600-kilometre (1,000 mi) length of the rupture (acting as a line source). This greatly increased the geographical area over which the waves were observed, reaching as far as Mexico, Chile, and the Arctic. The raising of the sea floor significantly reduced the capacity of the Indian Ocean, producing a permanent rise in the global sea level by an estimated 0.1 millimetres (0.004 in). Locations of initial earthquake and all aftershocks measuring greater than 4.0 from 26 December 2004 to 10 January 2005. The site of the original quake is marked by the large star in the lower right square of the grid. Numerous aftershocks were reported off the Andaman Islands, the Nicobar Islands and the region of the original epicentre in the hours and days that followed. The magnitude 8.7 2005 Nias–Simeulue earthquake, which originated off the coast of the Sumatran island of Nias, is not considered an aftershock, despite its proximity to the epicenter, and was most likely triggered by stress changes associated with the 2004 event. This earthquake was so large that it produced its own aftershocks (some registering a magnitude of as great as 6.1) and presently ranks as the 7th largest earthquake on record since 1900. Other aftershocks of up to magnitude 6.6 continued to shake the region daily for up to three or four months. As well as continuing aftershocks, the energy released by the original earthquake continued to make its presence felt well after the event. A week after the earthquake, its reverberations could still be measured, providing valuable scientific data about the Earth's interior. The December earthquake is thought to have triggered activity in both Leuser Mountain and Mount Talang, volcanoes in Aceh province along the same range of peaks, while the 2005 Nias–Simeulue earthquake had sparked activity in Lake Toba, an ancient crater in Sumatra. The tsunami strikes Ao Nang, Thailand. The energy released on the Earth's surface only (ME, which is the seismic potential for damage) by the 2004 Indian Ocean earthquake and tsunami was estimated at 1.1×1017 joules, or 26 megatons of TNT. This energy is equivalent to over 1,500 times that of the Hiroshima atomic bomb, but less than that of Tsar Bomba, the largest nuclear weapon ever detonated. However, the total work done MW (and thus energy) by this quake was 4.0×1022 joules (4.0×1029 ergs), the vast majority underground. This is over 360,000 times more than its ME, equivalent to 9,600 gigatons of TNT equivalent (550 million times that of Hiroshima) or about 370 years of energy use in the United States at 2005 levels of 1.08×1020 J. The only recorded earthquakes with a larger MW were the 1960 Chilean and 1964 Alaskan quakes, with 2.5×1023 joules (250 ZJ) and 7.5×1022 joules (75 ZJ) respectively. The earthquake generated a seismic oscillation of the Earth's surface of up to 20–30 cm (8–12 in), equivalent to the effect of the tidal forces caused by the Sun and Moon. The shock waves of the earthquake were felt across the planet; as far away as the U.S. state of Oklahoma, where vertical movements of 3 mm (0.12 in) were recorded. By February 2005, the earthquake's effects were still detectable as a 20 µm (0.02 mm; 0.0008 in) complex harmonic oscillation of the Earth's surface, which gradually diminished and merged with the incessant free oscillation of the Earth more than 4 months after the earthquake. Because of its enormous energy release and shallow rupture depth, the earthquake generated remarkable seismic ground motions around the globe, particularly due to huge Rayleigh (surface) elastic waves that exceeded 1 cm (0.4 in) in vertical amplitude everywhere on Earth. The record section plot displays vertical displacements of the Earth's surface recorded by seismometers from the IRIS/USGS Global Seismographic Network plotted with respect to time (since the earthquake initiation) on the horizontal axis, and vertical displacements of the Earth on the vertical axis (note the 1 cm scale bar at the bottom for scale). The seismograms are arranged vertically by distance from the epicenter in degrees. The earliest, lower amplitude, signal is that of the compressional (P) wave, which takes about 22 minutes to reach the other side of the planet (the antipode; in this case near Ecuador). The largest amplitude signals are seismic surface waves that reach the antipode after about 100 minutes. The surface waves can be clearly seen to reinforce near the antipode (with the closest seismic stations in Ecuador), and to subsequently encircle the planet to return to the epicentral region after about 200 minutes. A major aftershock (magnitude 7.1) can be seen at the closest stations starting just after the 200 minute mark. This aftershock would be considered a major earthquake under ordinary circumstances, but is dwarfed by the mainshock. Vertical-component ground motions recorded by the IRIS/USGS Global Seismographic Network. The shift of mass and the massive release of energy very slightly altered the Earth's rotation. The exact amount is not yet known, but theoretical models suggest the earthquake shortened the length of a day by 2.68 microseconds, due to a decrease in the oblateness of the Earth. It also caused the Earth to minutely "wobble" on its axis by up to 2.5 cm (1 in) in the direction of 145° east longitude, or perhaps by up to 5 or 6 cm (2.0 or 2.4 in). However, because of tidal effects of the Moon, the length of a day increases at an average of 15 µs per year, so any rotational change due to the earthquake will be lost quickly. Similarly, the natural Chandler wobble of the Earth, which in some cases can be up to 15 m (50 ft), will eventually offset the minor wobble produced by the earthquake. More spectacularly, there was 10 m (33 ft) movement laterally and 4–5 m (13–16 ft) vertically along the fault line. Early speculation was that some of the smaller islands south-west of Sumatra, which is on the Burma Plate (the southern regions are on the Sunda Plate), might have moved south-west by up to 36 m (120 ft), but more accurate data released more than a month after the earthquake found the movement to be about 20 cm (8 in). Since movement was vertical as well as lateral, some coastal areas may have been moved to below sea level. The Andaman and Nicobar Islands appear to have shifted south-west by around 1.25 m (4 ft 1 in) and to have sunk by 1 m (3 ft 3 in). In February 2005, the Royal Navy vessel HMS Scott surveyed the seabed around the earthquake zone, which varies in depth between 1,000 and 5,000 m (550 and 2,730 fathoms; 3,300 and 16,400 ft). The survey, conducted using a high-resolution, multi-beam sonar system, revealed that the earthquake had made a huge impact on the topography of the seabed. 1,500-metre-high (5,000 ft) thrust ridges created by previous geologic activity along the fault had collapsed, generating landslides several kilometres wide. One such landslide consisted of a single block of rock some 100 m high and 2 km long (300 ft by 1.25 mi). The momentum of the water displaced by tectonic uplift had also dragged massive slabs of rock, each weighing millions of tons, as far as 10 km (6 mi) across the seabed. An oceanic trench several kilometres wide was exposed in the earthquake zone. The TOPEX/Poseidon and Jason-1 satellites happened to pass over the tsunami as it was crossing the ocean. These satellites carry radars that measure precisely the height of the water surface; anomalies of the order of 50 cm (20 in) were measured. Measurements from these satellites may prove invaluable for the understanding of the earthquake and tsunami. Unlike data from tide gauges installed on shores, measurements obtained in the middle of the ocean can be used for computing the parameters of the source earthquake without having to compensate for the complex ways in which close proximity to the coast changes the size and shape of a wave. NOAA's tsunami travel time (TTT) map for the 2004 Indian Ocean tsunami. The TTT map calculates the first-arrival travel times of the tsunami, following their generation at the earthquake epicenter. Note that the maps do not provide the height or the strength of the wave, only the arrival times. The number tags represent hours after the initial event. Map contours represent 1-hour intervals. Red indicates 1- to 4-hour arrival times, Yellow indicates 5- to 6-hour arrival times, Green indicates 7- to 14-hour arrival times, and Blue indicates 15- to 21-hour arrival times. Maps were generated from earthquake epicenters in the NGDC Global Historical Tsunami Database using NGDC 2-Minute Gridded Global Relief Data bathymetry. The map was created through models based on quality-controlled source data, and an integration of many data sets together. The tsunami, like all others, behaved very differently in deep water than in shallow water. In deep ocean water, tsunami waves form only a small hump, barely noticeable and harmless, which generally travels at a very high speed of 500 to 1,000 km/h (310 to 620 mph); in shallow water near coastlines, a tsunami slows down to only tens of kilometres per hour but, in doing so, forms large destructive waves. Scientists investigating the damage in Aceh found evidence that the wave reached a height of 24 metres (80 ft) when coming ashore along large stretches of the coastline, rising to 30 metres (100 ft) in some areas when traveling inland. Radar satellites recorded the heights of tsunami waves in deep water: at two hours after the earthquake, the maximum height was 60 centimetres (2 ft). These are the first such observations ever made. Unfortunately these observations could not be used to provide a warning, since the satellites were not built for that purpose and the data took hours to analyze. According to Tad Murty, vice-president of the Tsunami Society, the total energy of the tsunami waves was equivalent to about five megatons of TNT (20 petajoules). This is more than twice the total explosive energy used during all of World War II (including the two atomic bombs) but still a couple of orders of magnitude less than the energy released in the earthquake itself. In many places the waves reached as far as 2 km (1.2 mi) inland. Tsunami wave field in the Bay of Bengal one hour after the M=9.2 earthquake. View to the northwest. Because the 1,600 km (1,000 mi) fault affected by the earthquake was in a nearly north-south orientation, the greatest strength of the tsunami waves was in an east-west direction. Bangladesh, which lies at the northern end of the Bay of Bengal, had very few casualties despite being a low-lying country relatively near the epicenter. It also benefited from the fact that the earthquake proceeded more slowly in the northern rupture zone, greatly reducing the energy of the water displacements in that region. Because of the distances involved, the tsunami took anywhere from fifteen minutes to seven hours to reach the coastlines. The northern regions of the Indonesian island of Sumatra were hit very quickly, while Sri Lanka and the east coast of India were hit roughly 90 minutes to two hours later. Thailand was struck about two hours later despite being closer to the epicentre, because the tsunami traveled more slowly in the shallow Andaman Sea off its western coast. The tsunami was noticed as far as Struisbaai in South Africa, some 8,500 km (5,300 mi) away, where a 1.5 m (5 ft) high tide surged on shore about 16 hours after the earthquake. It took a relatively long time to reach this spot at the southernmost point of Africa, probably because of the broad continental shelf off South Africa and because the tsunami would have followed the South African coast from east to west. The tsunami also reached Antarctica, where tidal gauges at Japan's Showa Base recorded oscillations of up to a metre (3 ft 3 in), with disturbances lasting a couple of days. Some of the tsunami's energy escaped into the Pacific Ocean, where it produced small but measurable tsunamis along the western coasts of North and South America, typically around 20 to 40 cm (7.9 to 15.7 in). At Manzanillo, Mexico, a 2.6 m (8 ft 6 in) crest-to-trough tsunami was measured. As well, the tsunami was large enough to be detected in Vancouver, British Columbia, Canada. This puzzled many scientists, as the tsunamis measured in some parts of South America were larger than those measured in some parts of the Indian Ocean. It has been theorized that the tsunamis were focused and directed at long ranges by the mid-ocean ridges which run along the margins of the continental plates. Maximum recession of tsunami waters at Kata Noi Beach, Thailand, before the third, and strongest, tsunami wave (sea visible in the right corner, the beach is at the extreme left), 10:25 am local time. Despite a lag of up to several hours between the earthquake and the impact of the tsunami, nearly all of the victims were taken completely by surprise. There were no tsunami warning systems in the Indian Ocean to detect tsunamis or to warn the general population living around the ocean. Tsunami detection is not easy because while a tsunami is in deep water it has little height and a network of sensors is needed to detect it. Setting up the communications infrastructure to issue timely warnings is an even bigger problem, particularly in a relatively poor part of the world. Tsunamis are much more frequent in the Pacific Ocean because of earthquakes in the "Ring of Fire", and an effective tsunami warning system has long been in place there. Although the extreme western edge of the Ring of Fire extends into the Indian Ocean (the point where this earthquake struck), no warning system exists in that ocean. Tsunamis there are relatively rare despite earthquakes being relatively frequent in Indonesia. The last major tsunami was caused by the Krakatoa eruption of 1883. It should be noted that not every earthquake produces large tsunamis; on 28 March 2005, a magnitude 8.7 earthquake hit roughly the same area of the Indian Ocean but did not result in a major tsunami. The first warning sign of a possible tsunami is the earthquake itself. However, tsunamis can strike thousands of kilometres away where the earthquake is only felt weakly or not at all. Also, in the minutes preceding a tsunami strike, the sea often recedes temporarily from the coast. This was observed on the eastern side of the rupture zone of the earthquake such as around the coastlines of Aceh province, Phuket island and Khao Lak area in Thailand, Penang island of Malaysia and the Andaman and Nicobar islands. Around the Indian Ocean, this rare sight reportedly induced people, especially children, to visit the coast to investigate and collect stranded fish on as much as 2.5 km (1.6 mi) of exposed beach, with fatal results. However, not all tsunamis cause this "disappearing sea" effect. In some cases, there are no warning signs at all: the sea will suddenly swell without retreating, surprising many people and giving them little time to flee. Reportedly, scuba divers near the abundant coral reefs in Thailand and the Maldives were reportedly caught off guard by violent, swirling underwater currents. The divers described the experience like being in a 'washing machine'. Coral reef animals like fish were also absent as the tsunami passed by. One of the few coastal areas to evacuate ahead of the tsunami was on the Indonesian island of Simeulue, very close to the epicentre. Island folklore recounted an earthquake and tsunami in 1907, and the islanders fled to inland hills after the initial shaking and before the tsunami struck. These tales and oral folklore from previous generations may have helped the survival of the inhabitants. On Maikhao beach in northern Phuket, Thailand, a 10-year-old British tourist named Tilly Smith had studied tsunami in geography at school and recognised the warning signs of the receding ocean and frothing bubbles. She and her parents warned others on the beach, which was evacuated safely. John Chroston, a biology teacher from Scotland, also recognised the signs at Kamala Bay north of Phuket, taking a busload of vacationers and locals to safety on higher ground. Anthropologists had initially expected the aboriginal population of the Andaman Islands to be badly affected by the tsunami and even feared the already depopulated Onge tribe could have been wiped out. Many of the aboriginal tribes evacuated and suffered fewer casualties. Oral traditions developed from previous earthquakes helped the aboriginal tribes escape the tsunami. For example, the folklore of the Onges talks of "huge shaking of ground followed by high wall of water". Almost all of the Onge people seemed to have survived the tsunami. A two story house damaged by the tsunami showing the tsunami inundation height in downtown Banda Aceh. The tsunami first struck the west and north coasts of northern Sumatra, Indonesia particularly in Aceh province in the fresh morning. At Ulee Lheue in Banda Aceh, a survivor described three waves, with the first wave rising only to the foundation of the buildings. This was followed by a large withdrawal of the sea before the second and third waves hit. The tsunami reached shore 15–20 minutes after the earthquake, and the second was bigger than the first. This is the same as that in Khao Lak and Phuket Island in southern Thailand. A local resident living at Banda Aceh states that the giant wave was 'higher than my house'. Another resident living 2 km (1.2 mi) near the coast on the outskirt of the city informed that the tsunami was 'like a wall, very black' in colour and had a 'distinct sound' getting louder as it nears the coast. The maximum runup height of the tsunami was measured at a hill between Lhoknga and Leupung, located on the west coast of the northern tip of Sumatra, near Banda Aceh, and reached more than 30 m (100 ft). • 15–30 m (49 ft-98 ft) on the west coast of Aceh. • 6–12 m (19.7 ft-39.4 ft) on the Banda Aceh coast. • 5 m (16.4 ft) on the Sigli coast. 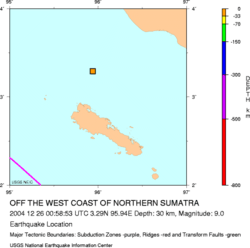 • 3–6 m (9.8 ft-19.7 ft) on the north coast of Weh Island directly facing the tsunami source. • 3 m (9.8 ft) on the opposite side of the coast of Weh Island facing the tsunami. The tsunami height on the Banda Aceh coast is lower than half of that on the west coast. Even within the Banda Aceh coast, the tsunami height was reduced by half from 12 m (39.4 ft) at Ulee Lheue to 6 m (19.7 ft) a further 8 km (4.97 miles) to the northeast. The inundation was observed to lie 3–4 km (1.86-2.49 miles) inland throughout the city. Flow depths over the ground were observed to be over 9 m (29.5 ft) in the seaside section of Ulee Lheue and tapered landward. The level of destruction was more extreme on the northwestern flank of the city in the areas immediately inland of the aquaculture ponds. The area toward the sea was wiped clean of nearly every structure, while closer to the river—dense construction in a commercial district showed the effects of severe flooding. The flow depth was just at the level of the second floor, and there were large amounts of debris piled along the streets and in the ground-floor storefronts. One of the reasons seems to be that there is an archipelago between Lhoknga and Banda Aceh.Within 2–3 km (1.24-1.86 miles) from the shoreline, houses, except for strongly-built reinforced concrete ones with brick walls, which seemed to have been partially damaged by the earthquake before the tsunami attack, were completely swept away or destroyed by the tsunami. Three small islands: Weh, Breuh, and Deudap, lie just north of the capital city. The tsunami effects on two of the islands Breuh and Deudap were extreme, with a runup of 10–20 m (33–66 ft) on the west-facing shores. Coastal villages were completely destroyed by the tsunami waves. On Pulau Weh, however, the island experienced strong surges in the port of Sabang, yet there was little damage with a reported runup values of 3–5 m (9.8-16.4 ft), which was most likely shadowed from the direct tsunami attack by the islands to the southwest. In Lhoknga, a town in Aceh Besar Regency, Aceh Special Region, Indonesia, located on the western side of the island of Sumatra, 13 km (8.08 miles) southwest of Banda Aceh was completely flattened and destroyed by the 2004 Boxing Day Tsunami, where its population dwindled from 7,500 to 400. The tsunami waves were almost 30 m (98.4 ft) high. Eyewitnesses reported 10 to 12 waves, the second and third ones being the highest. The sea receded (drawback) 10 minutes after the earthquake and the first wave came rapidly landward as a turbulent flow (flood) with depths ranging from 0.5 to 2.5 m (1.64 ft-8.20 ft) high. The second and third waves was 15–30 m (49.2 ft-98.4 ft) high at the coast, described having an appearance to a surf wave (cobra-shaped) but 'taller than the coconut trees' and was 'like a mountain'. Consequently, the tsunami also stranded cargo ships and barges and destroyed a cement factory near the Lampuuk coast. Moreover, surveyed areas by scientists show runup heights over 20 m (65.6 ft) on the northwest coast of Sumatra in the Aceh province with a maximum runup of 51 m (167.3 ft). In Meulaboh based on survivor testimonies, tsunami arrived after the sea receded about 500 m (0.31 miles), followed by an advancing small tsunami. The second and third destructive waves arrived later, which exceeded the height of the coconut trees. The inundation distance is about 5 km (3.1 miles). Such high and fast waves arising from the epicentre by a megathrust earthquake were later found to be due to splay faults, secondary faults arising due to cracking of the sea floor to jut upwards in seconds, causing waves' speed and height to increase. A large slip of 30 m (98.4 ft) was estimated on the subfault located off the west coast of Aceh province. Another factor is subsidence at Banda Aceh (20–60 cm), Peukan Bada (>20 cm), Lhok Nga and Leupung (>1.5 m). An overturned cement carrier, the Sinar Andalas caused by the tsunami in Lhoknga. Other towns on Aceh's west coast hit by the disaster included Leupung, Lhokruet, Lamno, Patek, Calang, Teunom, and the island of Simeulue. Affected or destroyed towns on the region's north and east coast were Pidie Regency, Samalanga, Panteraja and Lhokseumawe. The very high fatality in the area is mainly due to the unpreparedness of the population from such an event. Helicopter survey showed entire settlements virtually destroyed with destruction miles inland with only some mosques left standing, which provided refuge for the people from the tsunami. The major islands affected by the tsunami were in the South, Middle, and North Andaman Islands. 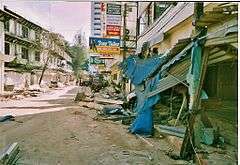 The tsunami arrived in the Andaman and Nicobar Islands minutes after the earthquake, and it caused extensive devastation to the islands' environment. Specifically, the Andaman Islands were moderately affected while the island of Little Andaman and the Nicobar Islands were severely affected by the tsunami. Waves nearly 3-storeys high, devastated the Indian Air Force base near Malacca. The worst affected island in the Andaman & Nicobar chain is Katchall Island with 303 people confirmed dead and 4,354 missing out of a total population of 5,312. Eyewitnesses at Port Blair recall that the water receded before the first wave, and the third wave was the tallest and caused the most damage. However, at Hut Bay, Malacca and Campbell Bay — locations far south of Port Blair — it was reported that the water level rose by about 1–2 m (3.3 ft-6.6 ft) from the normal sea level and remained there before the first wave crashed ashore. • 1.5 m (4.9 ft) at Diglipur and Rangat at North Andaman Island. • 10–12 m (32.8 ft-39.4 ft) high at Malacca (in Car Nicobar Island) and at Hut Bay (in Little Andaman Island). • 3 m (9.8 ft) high at Port Blair (in South Andaman Island). The tsunami first arrived on the eastern coast and subsequently refracted around the southern point of Sri Lanka (Dondra Head). The refracted tsunami waves inundated the southwestern part of Sri Lanka after some of its energy has been reflected from impact with the Maldives. Sri Lanka is located 1,700 km (1056.33 miles) far from the epicenter and the tsunami source, so no one felt the ground shake and the tsunami hit the entire coastline of Sri Lanka around 2 hours after the earthquake. It seems that the tsunami flooding consisted of three main waves, with the second being the largest and most destructive. The first tsunami waves had initially caused a small flood (positive wave) as it struck the Sri Lankan coastline. Moments later, the ocean floor was exposed to as much as 1 km (0.62 miles) in places due to drawback (negative wave). This was followed by a massive second tsunami wave, which is in the form of a flood. Certain locations managed to reduce the power of the waves through construction of seawalls and breakwaters. The largest run-up measured was at 12.5 m (41 ft) with inundation distance of 390 m to 1.5 km (0.242 miles-0.932 miles) in Yala. In Hambantota, tsunami run-ups are measured at 11 m (36.1 ft) with the greatest inundation distance of 2 km (1.24 miles), and tsunami run-up measurements along the Sri Lankan coasts are at 2.4–11 m (7.87 ft-36.1 ft). Tsunami waves measured on the east coast ranged from 4.5 m-9 m (14.8 ft-29.5 ft) at Pottuvill to around Batticaloa, 2.6 m- 5 m (8.53 ft-16.4 ft) in the northeast around Trincomalee and 4 m-5 m (13.1 ft-16.4 ft) in the west coast from Moratuwa to Ambalangoda. Fishermen's boat stranded in Kallady, Batticaloa, Sri Lanka. • 9 m (29.5 Ft) at Koggala. • 6 m (19.7 ft) at Galle port. • 4.8 m (15.7 ft) around the Galle coast. • 8.71 m (28.6 ft) at Nonagama. • 4.9 m (16.1 ft) at Weligama. • 4 m (13.1 ft) at Dodundawa. • 4.7 m (15.4 ft) at Ambalangoda. • 4.7 m (15.4 ft) at Hikkaduwa Fishery Harbour. • 10 m (33 ft) at Kahawa. • 4.8 m (15.7 ft) at North Beach of Beruwala. • 6 m (19.7 ft) at Paiyagala. The tsunami hit the southwest coast of southern Thailand, which was about 500 km (310.69 miles) from the epicenter. The region is famous for its high quality resorts, pristine beaches, spectacular islands with warm Andaman blue waters and stunning scenery making it prominent with tourists internationally. Since the tsunami hit around high tide, its damage was severe. Approximately 5,400 people were killed and 3,100 people were reported missing in Thailand. The places where the tsunami attacked were Khao Lak, Phuket Island, the Phi Phi Islands, Koh Racha Yai, Koh Lanta Yai and Ao Nang of Krabi province, offshore archipelagos like the Surin Islands, the Similan Islands, and coastal areas of Satun, Ranong, Phang Nga, Trang and Krabi provinces. • 6–10 m (19.7 ft-32.8 ft) in Khao Lak. • 3–6 m (9.84 ft-19.7 ft) along the west coast of Phuket island. • 3 m (9.84 ft) along the south coast of Phuket island. • 2 m (6.56 ft) along the east coast of Phuket island. • 4–6 m (13.12 ft-19.7 ft) on the Phi Phi Islands. • 19.6 m (64.3 ft) at Ban Thung Dap. • 5 m (16.4 ft) at Ramson. • 6.8 m (22.3 ft) at Ban Thale Nok. • 5 m (16.4 ft) at Hat Praphat (Ranong Coastal Resources Research Station). • 6.3 m (20.7 ft) at Thai Muang district. • 6.8 m (22.3 ft) at Rai Dan. The province of Phang-Nga was the most heavily affected area in Thailand by the gigantic tsunami. The northern part of Phang-Nga Province is a rural area with fishery and agricultural villages while the central part has several resort hotels. Khao Lak is located in the south of Phang-Nga Province with many luxurious hotels, popular to foreign tourists, especially from Europe. Khao Lak was hit by the gigantic tsunami after 10 AM and the death toll in Khao Lak was the largest in Thailand. Many local villagers and tourists lost their lives during the event. A maximum inundation of approximately 2 km (1.2 miles) and the inundated depths were 4–7 m (13.12 ft-23 ft) in Khao Lak. Surveys conducted show that the tsunami inundated the third floor of a resort hotel. The tsunami heights in Khao Lak were much higher than Phuket Island. The reason for this difference seems to have been caused by the local bathymetry off Khao Lak. According to some interviews with local residents and affected tourists, the leading wave produced an initial depression, called a tsunami drawback or 'disappearing sea' effect and the second wave was largest. The highest recorded tsunami runup measured was at 19.6 m (64.3 ft) at Ban Thung Dap, located on the southwest tip of Ko Phra Thong Island and the second highest at 15.8 m (51.8 ft) at Ban Nam Kim. 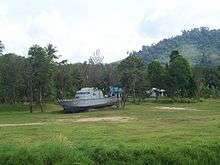 Thai navy boat 813 ( police boat ) stranded almost 2 km inland by the Khao Lak tsunami. At Phuket island, many of its west coast beaches were affected. At Patong Beach - a tourist mecca – the tsunami heights were 5–6 m (16.4 ft-19.7 ft) and the inundated depth was about 2 m (6.6 ft). The tsunami heights became lower from the west coast, the south coast to the east coast of the island. On Karon beach on the west coast, the coastal road was built higher than the shore and it acted as a seawall, protecting a hotel which was behind it. On the east coast of Phuket Island, which was not facing the tsunami source, the tsunami height was about 2 m (6.6 ft). In one river mouth, many boats were damaged. The tsunami propagated anticlockwise around Phuket Island, as was the case at Okushiri Island in the 1993 Hokkaido earthquake. According to some interviews with the people, the leading wave produced an initial depression and the second wave was the largest. Tsunami wave striking Phuket coast. The Phi Phi Islands are a group of small islands that were affected by the tsunami. The north bay of Phi Phi Don Island opens to the northwest, thus it faced in the direction that the tsunami came from. The measured tsunami height on this beach was 5.8 m (19.02 ft). According to some eyewitnesses accounts, the tsunami came from the north and south, and totally washed the central area away. The ground level here was about 2 m (6.6 ft) above sea level, but there were many cottages and hotels. Therefore, the tsunami waves from the north and south destroyed the area, the south bay opens to the southeast. It faces in the opposite direction to which the tsunami was propagated. Further, Phi Phi Le Island shields the port of Phi Phi Don Island. The measured tsunami height, however, was 4.6 m (15.1 ft) in this port. It indicated that the tsunami propagated around the islands. The tsunami arrived in the states of Andhra Pradesh and Tamil Nadu along the southeast coast of the Indian mainland shortly after 9:00 a.m. At least two hours later, it arrived in the state of Kerala along the southwest coast. Tamil Nadu, the union territory of Pondicherry and Kerala were extensively damaged, while Andhra Pradesh sustained moderate damage. There were two to five waves of varying height that coincided with the local high tide in some areas. Tsunami destruction in Chennai, Tamil Nadu, India. The tsunami run-up was only 1.6 m (5.2 ft) in areas in the state of Tamil Nadu that were shielded by the island of Sri Lanka, but was 4–5 m (13.1 ft-16.4 ft) in coastal districts such as Nagapattinam in Tamil Nadu that were directly across from Sumatra, which happen to be the highest on the Indian mainland. On the western coast, the runup elevations were 4.5 m (14.8 ft) at Kanyakumari District in Tamil Nadu, and 3.4 m (11.2 ft) each at Kollam and Ernakulam Districts in Kerala. The duration between the waves also varied from about 15 minutes to about 90 minutes. 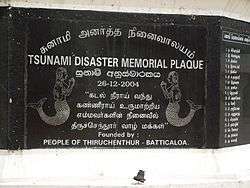 Additionally, the tsunami varies in height when it struck the Indian coast, ranging from 2–10 m (6.6 ft-33 ft) on average based on survivor's accounts. • 3.4 m (11.2 ft) at Kerala, inundation distance of 0.5-1.5 km (0.31-0.62 miles) with 250 km (155.3 miles) of coastline affected. • 4.5 m (14.8 ft) at southern coastline of Tamil Nadu, inundation distance of 0.2-2.0 km (0.12-1.24 miles) with 100 km (62.1 miles) of coast affected. • 5 m (16.4 ft) at eastern coastline of Tamil Nadu facing tsunami source, inundation distance of 0.4-1.5 km (0.25-0.93 miles) with 800 km (497 miles) of coastline affected. • 4 m (13.1 ft) at Pondicherry, inundation distance of 0.2-2.0 km (0.12-1.24 miles) with 25 km (15.5 miles) of coast affected. • 2.2 m (7.22 ft) at Andhra Pradesh, inundation distance of 0.2-1.0 km (0.12-0.62 miles) with 985 km (612 miles) of coast. The tsunami traveled 2.5 km (1.55 miles) at its maximum inland at Karaikal city. The inundation distance varied between 100–500 m (0.062 miles-0.311 miles) in most areas, except at river mouths, where it was more than 1 km (0.62 miles). The inundation distance varied with topology and vegetation. Areas with dense coconut groves or mangroves had much smaller inundation distances, and those with river mouths or backwaters saw much larger inundation distances.Presence of seawalls at the Kerala coast and some of Tamil Nadu coast helped to reduce the impact of the waves. However, when the seawalls were made of loose stones, the stones were displaced and carried a few metres inland. The state of Kerala experienced tsunami-related damage in three southern districts, Ernakulam, Alappuzha, and Kollam, which are densely populated with villagers, due to diffraction of the waves around Sri Lanka. The southernmost district of Thiruvananthpuram, however, escaped damage, possibly due to the wide turn of the diffracted waves at the peninsular tip. Major damage occurred in two narrow strips of land bound on the west by the Arabian Sea and on the east by a network of backwaters - Kerala backwaters. The waves receded before the first tsunami with the highest fatality reported from the densely populated Alappad panchayat (including the villages of Cheriya Azhikkal and Azhikkal) at Kollam district, caused by a 4 m (13.1 ft) tsunami. At the same time, many villages from many districts at the state of Andhra Pradesh was destroyed. 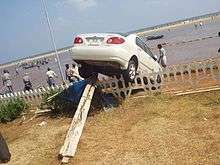 In the Krishna district, the tsunami created havoc in Manginapudi and on Machalipattanam Beach, which came like a running wall at the latter. The most affected was Prakasham District, recording 35 deaths, with maximum damage at Singraikonda, a beautiful beach hamlet. Given the enormous power of the tsunami, the fishing industry suffered the greatest. Moreover, the cost of damages in the transport sector was reported in the tens of thousands. Many buildings and infrastructures near the coast were obliterated. Conclusively, the tsunami effects varied greatly across different parts of the coast according to the number of waves experienced, the inundation distance and height of waves, and the population density of the area, as well as topological and geographical features that made some areas more vulnerable than others. Besides these factors, the number of lives lost was influenced by exposure to previous disasters and the local disaster management capability. Most of the people killed were members of the fishing community and, in some cases such as Marina Beach at Chennai and Velankanni in Nagapattinam, they were visitors on the beach. The tsunami of 26 December 2004 severely affected the Maldives at a distance of 2,500 km (1553.4 miles) from the epicenter of the magnitude 9.0 earthquake. The Maldives are an archipelagic country known for it amazing natural beauty - pristine white beaches, crystal clear seawater - amidst its location in the middle of the blue open Indian Ocean, with many of its atolls populated with luxurious tourist-oriented resorts. Identically to Sri Lanka, survivors reported three waves with the second wave being the most powerful. Being rich in coral reefs, the Maldives provides an opportunity for scientists to assess the impact of a tsunami on coral atolls. The significantly lower tsunami impact on the Maldives compared to Sri Lanka is largely due to the topography and bathymetry of the atoll chain with offshore coral reefs, deep channels separating individual atolls and its arrival within low tide which decreased the power of the tsunami. After the tsunami, there were some concern that the country might be totally submerged and become uninhabitable. However, this was proven untrue. The largest tsunami wave measured was 4 m (13.1 ft) at Vilufushi Island (Thaa Atoll). The tsunami arrived approximately 2 hours after the earthquake.The greatest tsunami inundation occurred at North Male Atoll, Male island at 250 m (0.155 miles) along the streets. • 1.3 m-2.4 m (4.27 ft-7.87 ft) at North Male Atoll, Male Island. • 2 m (6.56 ft) at North Male Atoll, Huhule Island. • 1.7 m-2.8 m (5.58 ft-9.2 ft) at South Male Atoll, Embudhu Finothu. • 2.5 m-3.3 m (8.2 ft-10.8 ft) at Laamu Atoll, Fonadhoo Island. • 2.2 m-2.9 m (7.2 ft-9.51 ft) at Laamu Atoll, Gan Island. • 2.3 m-3 m (7.5 ft-9.8 ft) at North Male Atoll, Dhiffushi Island. • 2.2 m-2.4 m (7.2 ft-7.87 ft) at North Male Atoll, Huraa Island. • more than 1.5 m (4.92 ft) at North Male Atoll, Kuda Huraa Island. In Myanmar, the tsunami caused only moderate damage, which arrived between 2 and 5.5 hours after the earthquake. Although the country's western Andaman Sea coastline lies at the proximity of the rupture zone, there were smaller tsunamis than the neighboring Thai coast, probably because the main tsunami source did not extend to the Andaman Islands. Another factor is that some coasts of Taninthayi Division was protected by offshore islands of the Myeik Archipelago. Based on scientific surveys from Ayeyarwaddy Delta through Taninthayi Division, it is revealed that tsunami heights along the Myanmar coast were between 0.4-2.9 m (1.3-9.5 ft). Eyewitnesses often compared the December tsunami heights with the “rainy season high tide”; although at most locations, the tsunami height was similar or smaller than the “rainy season high tide” level. • 0.6 m-2.3 m (1.97 ft-7.54 ft) around the Ayeyarwady delta. • 0.9 m-2.9 m (2.95 ft-9.5 ft) at Dawei area. • 0.7 m-2.2 m (2.3 ft-7.2 ft) around Myeik. • 0.4 m-2.6 m (1.3 ft-8.5 ft) around Kawthaung. Interviews with local people indicate that they did not feel the earthquake in Taninthayi Division or in Ayeyarwaddy Delta. The 71 casualties can be attributed to poor housing infrastructure and additionally, the fact that the coastal residents in the surveyed areas live on flat land along the coast, especially in the Ayeyarwaddy Delta, and that there is no higher ground to evacuate. The tsunami heights from the 2004 December earthquake were not more than 3 m (9.8 ft) along the Myanmar coast, the amplitudes are slightly large off the Ayeyarwaddy Delta, probably because the shallow delta cause a concentration in tsunami energy. 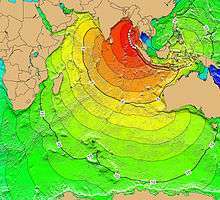 The tsunami spawned from the megathrust earthquake near Sumatra travelled 5000 km (3106.86 miles) west across the open ocean and ravaged the East African country of Somalia. Around 289 fatalities were reported in the Horn of Africa, drowned by four tsunami waves. The hardest hit was a 650 km (403.9 miles) stretch of the Somalia coastline between Garacad (Mudug region) and Xaafuun (Bari region), which forms part of the Puntland Province. Most of the victims were reported along the low-lying Xaafuun Peninsula. The Puntland coast in northern Somalia was by far the area hardest hit by the waves to the west of the Indian subcontinent. The waves arrived around noon local time. The highest death toll was in Xaafuun, also known as Hafun, with 19 bodies and 160 people presumed missing out of its 5000 inhabitants, this amounts to the highest number of casualties in a single African town and the largest tsunami death toll in a single town to the west of the Indian subcontinent. In Xaafuun, small drawbacks were observed before the third and most powerful tsunami flood the town. Apart from lives and livelihood lost during the disaster, numerous fishing boats and buildings were devastated. The tsunami also devastated Malaysia, mainly on the northern states such as Kedah, Perak and Penang and on offshore islands such as Langkawi island. Peninsular Malaysia was shielded by the full fury of the tsunami due to the protection offered by the island of Sumatra, which lies just off the western coast. 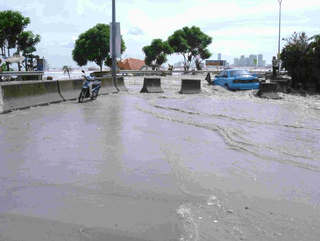 Tsunami flooding the streets of Tanjung Tokong, George Town, Penang. The tsunami's immense power was even detected as far away as Africa, where rough seas were reported, specifically on the eastern and southern coasts that faces the Indian Ocean. Countries apart from Somalia that were majorly affected with deaths include South Africa (the furthest)- 2, Kenya- 1, The Seychelles- 3 and Tanzania- 10. Chennai's Marina Beach after the tsunami. According to the U.S. Geological Survey a total of 227,898 people died (see table below for details). Measured in lives lost, this is one of the ten worst earthquakes in recorded history, as well as the single worst tsunami in history. Indonesia was the worst affected area, with most death toll estimates at around 170,000. However, another report by Siti Fadilah Supari, the Indonesian Minister of Health at the time, estimated the death total to be as high as 220,000 in Indonesia alone, giving a total of 280,000 fatalities. The tsunami caused serious damage and deaths as far as the east coast of Africa, with the farthest recorded death due to the tsunami occurring at Rooi Els in South Africa, 8,000 km (5,000 mi) away from the epicentre. In total, eight people in South Africa died due to abnormally high sea levels and waves. In addition to the large number of local residents, up to 9,000 foreign tourists (mostly Europeans) enjoying the peak holiday travel season were among the dead or missing, especially people from the Nordic countries. The European nation hardest hit may have been Sweden, whose death toll was 543. Countries most affected by the tsunami, with the earthquake's epicenter. The earthquake and resulting tsunami affected many countries in Southeast Asia and beyond, including Indonesia, Sri Lanka, India, Thailand, the Maldives, Somalia, Myanmar, Malaysia, Seychelles and others. Many other countries, especially Australia and those in Europe, had large numbers of citizens traveling in the region on holiday. Sweden lost 543 citizens in the disaster, while Germany had 539 identified victims. The last major tsunami in the Indian Ocean was about A.D. 1400. In 2008, a team of scientists working on Phra Thong, a barrier island along the hard-hit west coast of Thailand, reported evidence of at least three previous major tsunamis in the preceding 2,800 years, the most recent from about 700 years ago. A second team found similar evidence of previous tsunamis in Aceh, a province at the northern tip of Sumatra; radiocarbon dating of bark fragments in soil below the second sand layer led the scientists to estimate that the most recent predecessor to the 2004 tsunami probably occurred between A.D. 1300 and 1450. The 2004 earthquake and tsunami combined are the world's deadliest natural disaster since the 1976 Tangshan earthquake. This earthquake was the third most powerful earthquake recorded since 1900. The deadliest known earthquake in history occurred in 1556 in Shaanxi, China, with an estimated death toll of 830,000, though figures from this period may not be as reliable. The 2004 tsunami is the deadliest in recorded history. Prior to 2004, the tsunami created in both Indian and Pacific Ocean waters by the 1883 eruption of Krakatoa, thought to have resulted in anywhere from 36,000 to 120,000 deaths, had probably been the deadliest in the region. In 1782 about 40,000 people are thought to have been killed by a tsunami (or a cyclone) in the South China Sea. The most deadly tsunami prior to 2004 was Italy's 1908 Messina earthquake on the Mediterranean Sea where the earthquake and tsunami killed about 123,000. Both the earthquake and the tsunami may have affected shipping in the Malacca Straits, which separate Malaysia and the Indonesian island of Sumatra, by changing the depth of the seabed and by disturbing navigational buoys and old shipwrecks. In one area of the Strait, water depths were previously up to 4,000 feet (1,200 m), and are now only 100 feet (30 m) in some areas, making shipping impossible and dangerous. These problems also made the delivery of relief aid more challenging. Compiling new navigational charts may take months or years. However, officials hope that piracy in the region will drop off as a result of the tsunami. Countries in the region appealed to tourists to return, pointing out that most tourist infrastructure is undamaged. However, tourists were reluctant to do so for psychological reasons. Even beach resorts in parts of Thailand which were completely untouched by the tsunami were hit by cancellations. Tsunami inundation, Khao Lak, North of Phuket, Thailand ASTER Images and SRTM Elevation Model. According to specialists, the main effect is being caused by poisoning of the freshwater supplies and of the soil by saltwater infiltration and a deposit of a salt layer over arable land. It has been reported that in the Maldives, 16 to 17 coral reef atolls that were overcome by sea waves are completely without fresh water and could be rendered uninhabitable for decades. Uncountable wells that served communities were invaded by sea, sand, and earth; and aquifers were invaded through porous rock. Salted-over soil becomes sterile, and it is difficult and costly to restore for agriculture. It also causes the death of plants and important soil micro-organisms. Thousands of rice, mango, and banana plantations in Sri Lanka were destroyed almost entirely and will take years to recover. On the island's east coast, the tsunami contaminated wells on which many villagers relied for drinking water. The Colombo-based International Water Management Institute monitored the effects of saltwater and concluded that the wells recovered to pre-tsunami drinking water quality one and a half years after the event. IWMI developed protocols for cleaning wells contaminated by saltwater; these were subsequently officially endorsed by the World Health Organization as part of its series of Emergency Guidelines. Many health professionals and aid workers have reported widespread psychological trauma associated with the tsunami. Traditional beliefs in many of the affected regions state that a relative of the family must bury the body of the dead, and in many cases, no body remained to be buried. Women in Aceh required a special approach from foreign aid agencies, and continue to have unique needs. The hardest hit area, Aceh, is considered to be a religiously conservative Islamic society and has had no tourism nor any Western presence in recent years due to armed conflict between the Indonesian military and Acehnese separatists. Some believe that the tsunami was divine punishment for lay Muslims shirking their daily prayers and/or following a materialistic lifestyle. Others have said that Allah was angry that there were Muslims killing other Muslims in an ongoing conflict. Saudi cleric Muhammad Al-Munajjid attributed it to divine retribution against non-Muslim vacationers "who used to sprawl all over the beaches and in pubs overflowing with wine" during Christmas break. In a poll conducted in 27 countries by GlobeScan for BBC World Service, 15 percent of respondents named the tsunami the most significant event of the year. Only the Iraq War was named by as many respondents. The extensive international media coverage of the tsunami, and the role of mass media and journalists in reconstruction, were discussed by editors of newspapers and broadcast media in tsunami-affected areas, in special video-conferences set up by the Asia Pacific Journalism Centre. 26 December 2004 Asian Tsunami left both the people and government of India in a state of heightened alert. On 30 December 2004, four days after the tsunami, the Portland, Oregon-based company Terra Research notified the India government that its sensors indicated there was a possibility of 7.9 to 8.1 magnitude tectonic shift in the next 12 hours between Sumatra and New Zealand. In response, the India Home Affairs minister announced that a fresh onslaught of deadly tidal waves were likely along the India southern coast and Andaman and Nicobar Islands, even as there was no sign of turbulence in the region. The announcement generated panic in the Indian Ocean region and caused thousands to flee their homes, which resulted in jammed roads. The announcement was a false alarm and the Home Affairs minister withdrew their announcement. On further investigation, the India government learned that the consulting company Terra Research was run from the home of a self-described earthquake forecaster who had no telephone listing and maintained a website where he sold copies of his detection system. Three days after the announcement, Indian National Congress president Sonia Gandhi called Science & Technology minister Kapil Sibal to express her concern about Sibal's 30 December public warning being "hogwash". The tsunami had a severe humanitarian and political impact in Sweden. The hardest hit country outside Asia, 543 Swedish tourists, mainly in Thailand, died. With no single incident having killed more Swedish people since the battle of Poltava in 1709, the cabinet of Göran Persson was heavily criticized for lack of action. Smith Dharmasaroja, a meteorologist who predicted the tsunami before it hit, was assigned the development of the Thai tsunami warning system. The Indian Ocean Tsunami warning system was formed in early 2005 immediately after the tragedy of 26 December 2004 to provide an early warning of tsunamis for inhabitants around the Indian Ocean coasts. The changes in the distribution of masses inside the Earth due to the seism had several consequences. It displaced the North Pole by 2.5 cm. It also changed slightly the shape of the Earth, more specifically it decreased Earth's oblateness by about one part in 10 billion, consequentially increasing Earth's rotation a little and thus shortening the length of the day by 2.68 microseconds. Children of Tsunami: No More Tears (2005), a 24-minute documentary film. Tsunami: The Aftermath (2006), a two-part television miniseries about its after-effects. Kayal (2015), a Tamil drama film which culminates with the 2004 tsunami. Tsunami: Caught on Camera (2009), a minute-by-minute account of the Boxing Day 2004 tsunami told through amateur video footage of people who were there from Indonesia, Thailand and Sri Lanka. Another result of the tsunami, respective of Indian culture, was the water that washed away centuries of sand from some of the ruins of a 1,200-year-old lost city at Mahabalipuram on the south coast of India. The site, containing such notable structures as a half-buried granite lion near a 7th-century Mahablipuram temple and a relic depicting an elephant, is part of what archaeologists believe to be an ancient port city that was swallowed by the sea hundreds of years ago. 1 2 3 4 5 "Magnitude 9.1 – OFF THE WEST COAST OF SUMATRA". U.S. Geological Survey. Retrieved 26 August 2012. 1 2 Paris, R.; Lavigne F.; Wassimer P.; Sartohadi J. (2007). "Coastal sedimentation associated with the December 26, 2004 tsunami in Lhok Nga, west Banda Aceh (Sumatra, Indonesia)". Marine Geology. Elsevier. 238 (1–4): 93–106. doi:10.1016/j.margeo.2006.12.009. ↑ If the death toll in Myanmar was 400–600 as claimed by dissident groups there, rather than just 61 or 90, more than 230,000 people would have perished in total from the tsunami. ↑ Earthquakes with 50,000 or More Deaths Archived 5 June 2013 at the Wayback Machine. 1 2 "Indonesia quake toll jumps again". BBC News. 25 January 2005. Retrieved 24 December 2012. ↑ "Analysis of the Sumatra-Andaman Earthquake Reveals Longest Fault Rupture Ever - NSF - National Science Foundation". ↑ West, Michael; Sanches, John J.; McNutt, Stephen R. "Periodically Triggered Seismicity at Mount Wrangell, Alaska, After the Sumatra Earthquake." Science. Vol. 308, No. 5725, 1144–1146. 20 May 2005. 1 2 Nalbant, S., Steacy, S., Sieh, K., Natawidjaja, D., and McCloskey, J. "Seismology: Earthquake risk on the Sunda trench." Nature. Vol. 435, No. 7043, 756–757. 9 June 2005. Retrieved 16 May 2009. Archived 18 May 2009. ↑ Jayasuriya, Sisira and Peter McCawley, "The Asian Tsunami: Aid and Reconstruction after a Disaster". Cheltenham UK and Northampton MA USA: Edward Elgar, 2010. ↑ "Tsunamis and Earthquakes: Tsunami Generation from the 2004 Sumatra Earthquake — USGS Western Coastal and Marine Geology". Walrus.wr.usgs.gov. Retrieved 12 August 2010. ↑ McKee, Maggie. "Power of tsunami earthquake heavily underestimated." New Scientist. 9 February 2005. Archived 27 February 2005 at the Wayback Machine. ↑ EERI Publication 2006–06, page 14. ↑ Lovholt, F., Bungum, H., Harbitz, C.B., Glimsal, S., Lindholm, C.D., and Pedersen, G. "Earthquake related tsunami hazard along the western coast of Thailand." Natural Hazards and Earth System Sciences. Vol. 6, No. 6, 979–997. 30 November 2006. Retrieved 16 May 2009. Archived 18 May 2009. ↑ Sibuet, J-C., Rangin, C., Le Pichon, X., Singh, S., Cattaneo, A., Graindorge, D., Klingelhoefer, F., Lin, J-Y., Malod, J., Maury, T., Schneider, J-L., Sultan, N., Umber, M., Yamaguchi, H., and the "Sumatra aftershocks" team, "26 December 2004 great Sumatra–Andaman earthquake: Co-seismic and post-seismic motions in northern Sumatra." Earth and Planetary Science Letters. Vol. 263, Issues. 1–2, 88–103. 15 November 2007. Retrieved 16 May 2009. Archived 18 May 2009. ↑ "Kamchatka Earthquake, 4 November 1952." United States Geological Survey. ↑ Vallée, M. (2007). "Rupture Properties of the Giant Sumatra Earthquake Imaged by Empirical Green's Function Analysis" (PDF). Bulletin of the Seismological Society of America. Seismological Society of America. 97 (1A): S103–S114. Bibcode:2007BuSSA..97S.103V. doi:10.1785/0120050616. ↑ Bilham, Roger. "A Flying Start, Then a Slow Slip." Science. Vol. 308, No. 5725, 1126–1127. 20 May 2005. ↑ USGS (22 July 2010). "Poster of the Northern Sumatra Earthquake of 28 March 2005 – Magnitude 8.7". Archived from the original on 14 May 2011. Retrieved 26 June 2011. ↑ "Sumatra shaken by new earthquake". BBC News. 10 April 2005. Retrieved 24 December 2012. ↑ "USGS Earthquake Hazards Program: FAQ". Earthquake.usgs.gov. 10 December 2012. Retrieved 24 December 2012. ↑ "Magnitude 9.1 Sumatra-Andaman Islands Earthquake FAQ". USGS. 29 December 2014. Retrieved 6 January 2015. ↑ Rinaldo, Aditya. "Thousands flee as Indonesian volcano spews into life." Hindustan Times. 12 April 2005. ↑ Johnston, Tim (13 April 2005). "Indonesian Volcanoes Erupt; Thousands Evacuated". VOA News. Archived from the original on 21 April 2005. Retrieved 22 April 2006. ↑ "USGS Energy and Broadband Solution". National Earthquake Information Center, US Geological Survey. Retrieved 12 August 2010. ↑ "USGS, Harvard Moment Tensor Solution". National Earthquake Information Center, US Geological Survey. 26 December 2004. Retrieved 12 August 2010. ↑ "USGS:Measuring the size of earthquakes". Earthquake.usgs.gov. 27 October 2009. Archived from the original on 1 September 2009. Retrieved 12 August 2010. ↑ Virtanen, H. (2006). Studies of earth dynamics with superconducting gravimeter (PDF). Academic Dissertation at the University of Helsinki. Retrieved 21 September 2009. ↑ Cook-Anderson, Gretchen; Beasley, Dolores. "NASA Details Earthquake Effects on the Earth." NASA (press release). 10 January 2005. ↑ Schechner, Sam. "Earthquakes vs. the Earth's Rotation." Slate. 27 December 2004. ↑ Staff Writer. "Italian scientists say Asian quakes cause Earth's axis shifted." Xinhua. 29 December 2004. ↑ Staff Writer (31 January 2005). "Quake moved Sumatra by only 20 centimeters: Danish scientists". Agence France-Presse. ↑ Bagla, Pallava (28 January 2005). "After the Earth Moved". Science Now. ↑ Knight, Will. "Asian tsunami seabed pictured with sonar." New Scientist. 10 February 2005. Archived 27 February 2005 at the Wayback Machine. ↑ Staff Writer. "NASA/French Satellite Data Reveal New Details of Tsunami." Jet Propulsion Laboratory/NASA. 11 January 2005. ↑ TOPEX/Poseidon Satellite Data on 26 December 2004 tsunami in the Indian Ocean. Aviso. ↑ Lorca, Emilio; Recabarren, Margot (1997). Earthquakes and Tsunamis. ↑ Leslie, John. "NOAA Scientists able to Measure Tsunami Height from Space." NOAA Magazine. 10 January 2005. ↑ McKee, Maggie. "Radar satellites capture tsunami wave height." New Scientist. 6 January 2005. Archived 24 September 2008 at the Wayback Machine. ↑ Pearce, Fred; Holmes, Bob. "Tsunami: The impact will last for decades." New Scientist. 15 January 2005. Archived 17 April 2008 at the Wayback Machine. ↑ "Tsunami time travel map". Tsunami Laboratory, Novosibirsk, Russia. Archived from the original on 3 April 2012. Retrieved 20 July 2012. ↑ "Time travel map: Active Fault Research Center: National Institute of Advanced Industrial Science and Technology, Japan". Staff.aist.go.jp. Archived from the original on 17 July 2012. Retrieved 24 December 2012. ↑ "Indian Ocean Tsunami" at Syowa Station, Antarctica, Hydrographic and Oceanographic Dept. Japan Coast Guard. ↑ Indian Ocean Tsunami of 26 December 2004. West Coast/Alaska Tsunami Warning Center (USGS). 31 December 2004. ↑ Carey, Bjorn. "Tsunami Waves Channeled Around the Globe in 2004 Disaster." LiveScience. 25 August 2005. ↑ "The 2004 Boxing Day tsunami". Australian Geographic. Retrieved 5 March 2015. ↑ Block, Melissa. "Sri Lankans Seek Lost Relatives After Tsunami." All Things Considered/NPR. 27 December 2004. ↑ Campbell, Matthew; Loveard, Keith; et al. "Tsunami disaster: Focus: Nature's timebomb." Times Online. 2 January 2005. ↑ "Girl, 10, used geography lesson to save lives". The Telegraph. London. 1 January 2005. ↑ Subir Bhaumik (30 December 2004). "Andaman aborigines' fate unclear". BBC News. Retrieved 13 February 2010. ↑ Gupta, Manu; Sharma, Anshu (2006). "Compounded loss: the post tsunami recovery experience of Indian island communities". Disaster Prevention and Management. 15 (1): 67–78. doi:10.1108/09653560610654248. ↑ Math, Suresh Bada; Girimaji‌1, Satish Chandra; Benegal, V; Uday Kumar, GS; Hamza, A; Nagaraja, D (2006). "Tsunami: Psychosocial aspects of Andaman and Nicobar islands. Assessments and intervention in the early phase". International Review of Psychiatry. 18 (3): 233–239. doi:10.1080/09540260600656001. PMID 16753660. ↑ Bhaumik, Subir (20 January 2005). "Tsunami folklore 'saved islanders'". BBC News. ↑ red17khmer (30 November 2008). "Great Tsunami 12/26/04 @ Aceh, Sumatra, Indonesia 1 of 3" – via YouTube. ↑ Kaget Mera (25 January 2016). "Seconds From Disaster S03E13 Asian Tsunami" – via YouTube. ↑ red17khmer (30 November 2008). "Great Tsunami 12-26-04 at Banda Aceh, Sumatra, Indonesia 3 of 3" – via YouTube. ↑ geoffmackley (19 November 2009). "Boxing Day Tsunami Banda Aceh 4 of 4" – via YouTube. 1 2 "Tsunami in andaman & nicobar islands, india". 1 2 Goff, James; Liu, Philip L-F.; Higman, Bretwood; Morton, Robert; Jaffe, Bruce E.; Fernando, Harindra; Lynett, Patrick; Fritz, Hermann; Synolakis, Costas; Fernando, Starin. 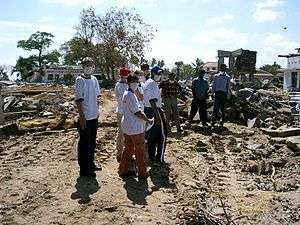 "Sri Lanka Field Survey after the December 2004 Indian Ocean Tsunami". 22 (S3): 155–172. doi:10.1193/1.2205897. ↑ Liu, P. L.-F. (1 July 2005). "Observations by the International Tsunami Survey Team in Sri Lanka". 308 (5728): 1595–1595. doi:10.1126/science.1110730. 1 2 "Tsunami - Tsunami Disaster in Sri Lanka". 1 2 3 "Tsunami Affected Areas in India 2004". 1 2 3 Jha, M. K. (20 July 2010). "Natural and Anthropogenic Disasters: Vulnerability, Preparedness and Mitigation". Springer Science & Business Media – via Google Books. 1 2 "Tsunami - India". ↑ "Tsunami death toll passes 283,000 - Asia Tsunami - www.smh.com.au". ↑ "International Tsunami Information Center - International Tsunami Information Center". ↑ Fritz, Hermann M.; Borrero, Jose C.; Synolakis, Costas E.; Okal, Emile A. (1 January 2006). "FIELD SURVEYS OF 2004 INDIAN OCEAN TSUNAMI FROM SUMATRA TO EAST AFRICA". ↑ "Home". Islamic Relief USA. Archived from the original on 17 January 2011. Retrieved 12 August 2010. ↑ "Most tsunami dead female - Oxfam". BBC News. 26 March 2005. Retrieved 24 December 2012. ↑ "Sweden aide quits over bar furore". BBC News. 1 November 2007. Retrieved 27 July 2008. ↑ Meisl, C.S. ; Safaie S.; Elwood K.J. ; Gupta R.; Kowsari R. (2006). "Housing Reconstruction in Northern Sumatra after the December 2004 Great Sumatra Earthquake and Tsunami". Earthquake Spectra. 22: S777. doi:10.1193/1.2201668. Retrieved 26 June 2011. 1 2 3 "One year after the tsunami, Sri Lankan survivors still live in squalour". World Socialist Web Site. 29 December 2005. Retrieved 24 December 2012. 1 2 "TsunamiMemorial.or.th". Web.archive.org. 28 September 2007. Archived from the original on 28 September 2007. Retrieved 24 December 2012. ↑ Schwartz, D.; Goldberg A.; Ashenasi I.; Nakash G.; Leiba A.; Levei Y.; Bar-Dayan Y. (2006). "Prehospital care of tsunami victims in Thailand: description and analysis". Prehospital Disaster Medicine. 21 (3): 204–210. PMID 16892886. ↑ Martin Plaut (26 December 2005). "Tsunami: Somalia's slow recovery". BBC News. Retrieved 24 December 2012. ↑ "India, Indonesia, Maldives, Myanmar, Somalia, Thailand: Earthquake and Tsunami OCHA Situation Report No. 14". Reliefweb.int. Retrieved 12 August 2010. ↑ "Myanmar is withholding true casualties figures, says Thai priest". AsiaNews.it. 4 January 2005. Archived from the original on 9 October 2006. Retrieved 12 February 2011. A missioner in Ranong, a town on the border between Thailand and Myanmar, says locals talk about 600 victims. Burmese political dissidents say the same. ↑ "Asia-Pacific | 'Hundreds feared dead' in Burma". BBC News. 4 January 2005. Retrieved 24 December 2012. ↑ "TsunamiMaldives.mv". Web.archive.org. 17 June 2009. Archived from the original on 17 June 2009. Retrieved 24 December 2012. ↑ UNICEF (May 2006). "The 2004 Indian Ocean Tsunami Disaster: Evaluation of UNICEF's response (emergency and recovery phase). Maldives Report" (PDF). p. i. Retrieved 26 June 2011. ↑ english@peopledaily.com.cn (13 January 2005). "Death toll in Asian tsunami disaster tops 159,000". People's Daily. Retrieved 12 August 2010. ↑ "Killer Waves". Channelnewsasia.com. Archived from the original on 2012-10-23. Retrieved 24 December 2012. ↑ "Asian tsunami death toll passes 144,000". Australia: ABC. 3 January 2005. Archived from the original on 17 June 2009. Retrieved 12 August 2010. 1 2 "The Seychelles raises its voice". Web.archive.org. Retrieved 12 August 2010. ↑ "Tsunami Evaluation Coalition: Initial Findings" (PDF). Archived from the original (PDF) on 24 March 2006. Retrieved 12 August 2010. ↑ Okal, E.A. ; Hartnady C.J. (2010). "The South Sandwich Islands earthquake of 27 June 1929: seismological study and inference on tsunami risk for the southern Atlantic" (PDF). South African Journal of Geology. 112 (3–4): 359–370. doi:10.2113/gssajg.112.3-4.359. Retrieved 26 June 2011. ↑ "YEMEN: Tsunami damage over US $1 million - UNEP assessment". Irinnews.org. 22 February 2005. Retrieved 24 December 2012. ↑ "Tsunami devastates Somali island". BBC News. 29 December 2004. Retrieved 24 December 2012. ↑ Palmer, Jason (29 October 2008). "Tsunami in 2004 'not the first'". BBC News. Retrieved 12 August 2010. ↑ "Researchers uncover 2004 tsunami predecessor". ABC Radio Australia News. 30 October 2008. Retrieved 13 April 2011. ↑ "Scientists Find Evidence of Tsunamis on Indian Ocean Shores Long Before 2004". Newswise.com. 27 October 2008. Retrieved 24 December 2012. ↑ Most Destructive Known Earthquakes on Record in the World (Earthquakes with 50,000 or More Deaths). United States Geological Survey. Archived 1 September 2009 at the Wayback Machine. ↑ "The world's worst natural disasters". ↑ "UN upbeat on tsunami hunger aid". BBC News. 9 January 2005. Retrieved 24 December 2012. ↑ "United Nations: World Food Programme: Report on the Tsunami Crisis". Reliefweb.int. 4 November 2005. Retrieved 24 December 2012. ↑ Chapter 3, "The matter of money", in Jayasuriya, Sisira and Peter McCawley, "The Asian Tsunami: Aid and Reconstruction after a Disaster". Cheltenham UK and Northampton MA USA: Edward Elgar, 2010. ↑ Staff Writer (27 January 2005). "Tsunami aid: Who's giving what". BBC News. Retrieved 22 April 2006. ↑ Staff Writer. "Clinton, Bush: Tsunami Aid Helping." The Early Show/CBS News. 21 February 2005. ↑ Staff Writer. "Tsunami aid shortfall over $4bn." BBC News. 18 March 2005. ↑ GUNATILLAKE, DAYA GUNATILLAKE (2007). "The 2004 Tsunami in Sri Lanka: Destruction and recovery". Geography. 92 (3): 285–293. JSTOR 40574342&Search=yes&searchText=2004&searchText=tsunami&searchText=impact&searchText=economic&list=hide&searchUri=%2Faction%2FdoBasicSearch%3FQuery%3Deconomic%2Bimpact%2Bof%2Bthe%2B2004%2Btsunami%26acc%3Don%26wc%3Don&prevSearch=&item=15&ttl=667&returnArticleService=showFullText&resultsServiceName=null. ↑ Staff Writer. "Indian Ocean Tsunamis Devastate Fisherfolk." UK Agricultural Biodiversity Coalition. 26 December 2004. ↑ Staff Writer. "Food Supply and Food Security Situation in Countries Affected by the Asia Tsunami." Food and Agriculture Organization of the United Nations. 14 January 2005. ↑ "Demand for FRP boats rise after tsunami" (PDF). Archived (PDF) from the original on 1 November 2010. Retrieved 12 August 2010. ↑ Pearce, Fred. "Tsunami's salt water may leave islands uninhabitable." New Scientist. 5 January 2005. Archived 22 April 2008 at the Wayback Machine. ↑ Rigg, Johnathan; Lisa Lawt; May Tan-Mullins; Carl Grundy-Warr (December 2005). "The Indian Ocean Tsunami: Socio-Economic Impacts in Thailand.". The Geographic Journal. 171 (4): 374–379. doi:10.1111/j.1475-4959.2005.00175_3.x. JSTOR 3451210. ↑ Staff Writer. "Tsunami redrew ship channels, ocean floor." MSNBC/Associated Press. 5 January 2005. ↑ Chapter 6, "Thailand", in Jayasuriya, Sisira and Peter McCawley, The Asian Tsunami: Aid and Reconstruction after a Disaster. Cheltenham UK and Northampton MA USA: Edward Elgar, 2010. ↑ Staff Writer. "Impact of Tsunamis on Ecosystems." UN Atlas of the Oceans. Retrieved 10 March 2005. ↑ Falt, Eric. "Environmental Issues Emerging from Wreckage of Asian Tsunami." United Nations Environment Programme. ↑ "United Nations Environment Programme; Environment for Development". Archived from the original on 19 April 2006. Retrieved 22 April 2006. ↑ Broadway, Bill. "Divining a Reason for Devastation." The Washington Post. 8 January 2005. ↑ "Memorandum of Understanding between Indonesian government and the Free Aceh Movement" (PDF). BBC News. 15 August 2005. Retrieved 24 December 2012. ↑ "Most significant events of 2005" (PDF). BBC World Service. 30 December 2005. Retrieved 26 September 2013. , and "Iraq war and tsunami top BBC poll". BBC World Service. 30 December 2005. Retrieved 26 September 2013. , see also Brighton, Paul; Foy, Dennis (2007). News Values. London: Sage. p. 44. ISBN 978-1412946001. ↑ "Asia Pacific Journalism Centre — Home Page". Archived from the original on 13 October 2007. Retrieved 24 October 2007. 1 2 Press Trust of India (30 December 2004) "Alert scaled down, capping day long confusion." 1 2 Tran, Tina. (30 December 2004) Associated Press "False tsunami alarm sparks panic in Indian Ocean region." ↑ Associated Press (31 December 2004) "Suspect quake forecast causes panic." ↑ The Financial Express (2 January 2005) "Congress chief steps in as home, S&T ministers lock horns." ↑ Cook-Anderson, Gretchen; Beasley, Dolores (January 10, 2005). "NASA Details Earthquake Effects on the Earth". National Aeronautics and Space Administration (press release). ↑ Staff Writer. "Tsunami waves exposed remnants of lost city." New Scientist. 26 February 2005. Archived 8 October 2008 at the Wayback Machine. ↑ "India finds more 'tsunami gifts'". BBC News. 27 February 2005. Retrieved 24 December 2012. 2004 Indian Ocean earthquake and tsunami in the Newseum archive of front page images from 2004-12-27.